Inshallah this coming 2015 will open more door for us. Ameen. Our dear customer has been ordering our all time roast chicken and I guess its been delicious roast chicken and order keep coming back. So, I decided to make roast chicken on NYE too. This one is indeed the perfect roast chicken you ever have. Three ingredients only needed; seriously just three. Most important thing is to follow the exact instructions. 1. Let you chicken come to room temperature before you roast it. 2. 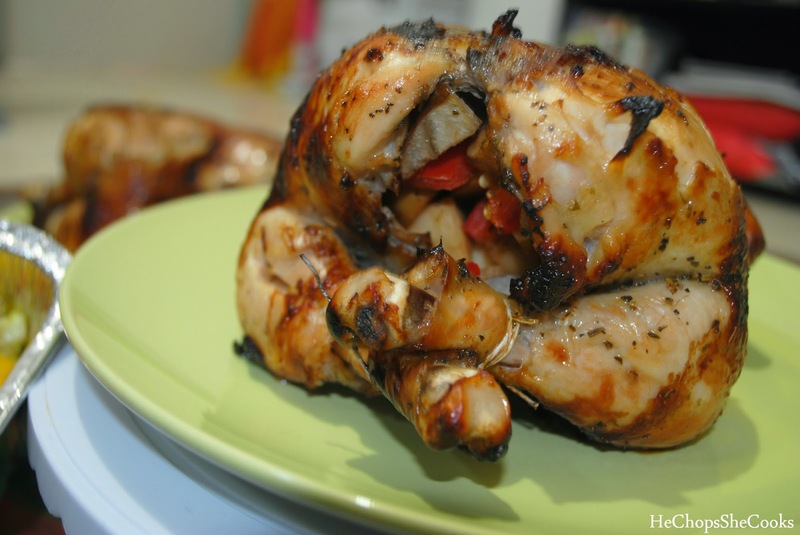 Take your chicken out of the fridge at least 45 mins before you roast it. If not your chicken will not turn tender and juicy. 3. Don't wash your chicken, well this might sound yucks but believe me once you cook the chicken to proper temp. any dangerous germ or bacteria will be kill in a min! 5. Dry your chicken properly on the outside and inside because any excess water will make your chicken drier. Use your paper towel to clean it. 6. Next, sprinkle salt and pepper inside and outside of the chicken. 8. Place the chicken breast side up on a rack over a roasting pan. 9. Put it in the 450°F oven for 50–60 minutes. 10. Don't check the chicken or open the oven door unless smoke starts pouring out. 11. Your chicken is done when its internal temperature is 165 degrees. 12. Let your chicken sit on a cutting board for 15 minutes before removing the twine. Add your stuffing before you twine your chicken legs together. I stuffed with apple, pear, capsicum. Anything will do. You can even stuffed it with rice. If you don't have thermometer; you can check by poking with something sharp just to check on it. Looks so juicy and succulent . I can see why people keep coming back for more of this. Nice instructions to keep the chicken moist cause that is the major issue with most chicken roasts. If you do it wrong you get very dry chicken.